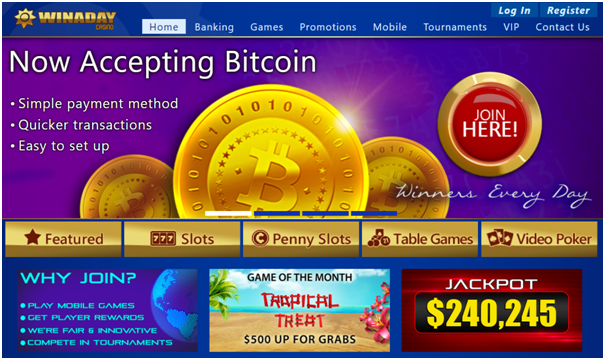 Winaday casino is a Bitcoin casino that offers BTC deposits and withdrawals to play casino games. This online casino is operated by Slotland Entertainment and is licensed and regulated by the Government of Anjouan. 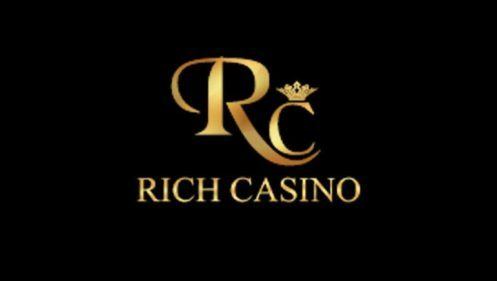 Founded in 2007 this casino came up after the success of its sister casino Slotland and offers over 100 games to enjoy with your PC/Laptop/ Mobile or Tablet. You will find a great variety in games with wide selection of premium slots, table games, poker variations and more. You need to be 18 and over years of age to play games at this casino. As said above there are over 100 games to enjoy here powered by Slotland Entertainment and its own Win a Day Software. 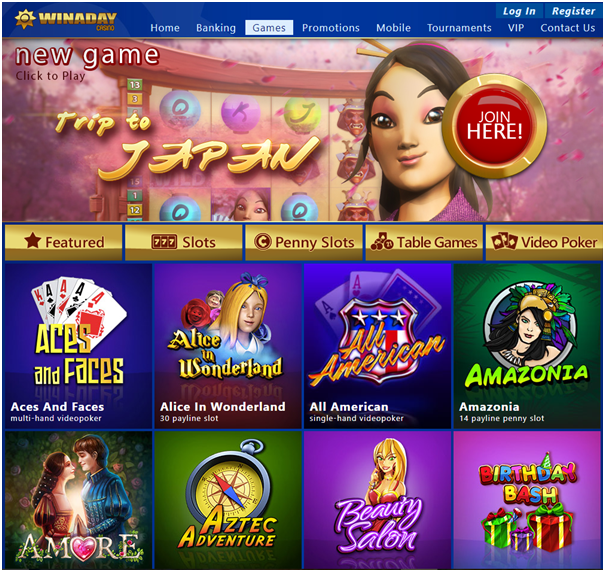 Winaday’s games are divided into four different categories: Penny Slots, Premium Slots, Table Games, and Video Poker. Penny Slots are fun slot games that demand minimal betting amounts, so that you can spin for as long as you like without making a dent into your cash balance. The majority of the games are regular slots games, each creatively designed to offer fun themes and unique in-game bonus features. Expect wild cards, free spins, multipliers, and games within the game. If you are interested in Table Games just click on the one you wish to play though there are only four of them to choose from mainly keno and roulette. Also there are a whole host of different poker games, each with different payout tables and bonus features. Many of the games also give the opportunity to win big, with the site-wide Progressive Jackpot. This is always set at a minimum of $50,000 and often reaches far greater heights. Each game is markedly different, and the originality of the graphics and themes are one of the main reasons Winaday players keep coming back for more. New games are frequently added, each with their own distinct features to enjoy. The winner of any tournament is the player with the highest score at the end of the tournament. All players’ scores are constantly updated during the tournament and are displayed on the leaderboard. Every player has 100 tournament rounds to gain the most points, after all 100 rounds have been played the score is no longer calculated and your final score is displayed on the leaderboard. If two or more players end up having the same score, the player who got the score first wins. Every player has 100 rounds to gain the most points in each tournament. 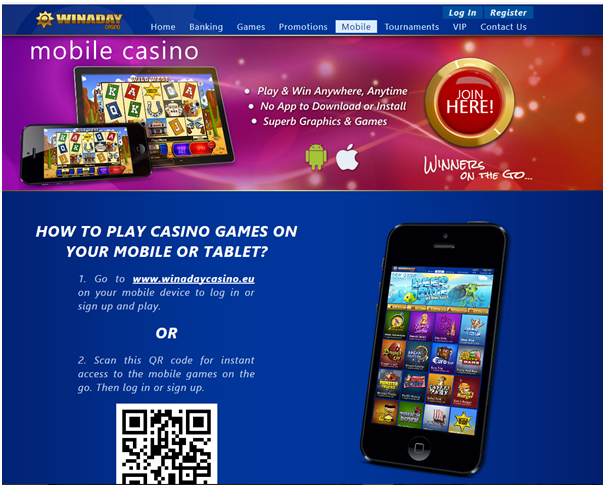 Winaday casino also offers mobile games to enjoy with your smartphones and tablets. All the games are compatible with iOS and Android devices. All you need is a good internet connection and start playing with your mobile. You do not require anything download as all the games are available to play instantly. All it takes is to open the casino page in your mobile browser and log in or register a new account. Also grab the offers and bonuses to play games with your mobile. There are many bonuses and offers available to redeem at the casino to play games. When you register yourself for the first time at this casino you are offered $500 registration bonus. This comes in a pack of your first five deposits in coupon codes. Note that the above bonus is offered in slots, keno and video poker games. Then there is game of the month bonus where each month casino features a different game and all players get the chance to win fantastic cash prizes just for playing it. Also find daily cash prizes where each day one lucky player is randomly selected to receive up to $100 free for depositing in the past 7 days. 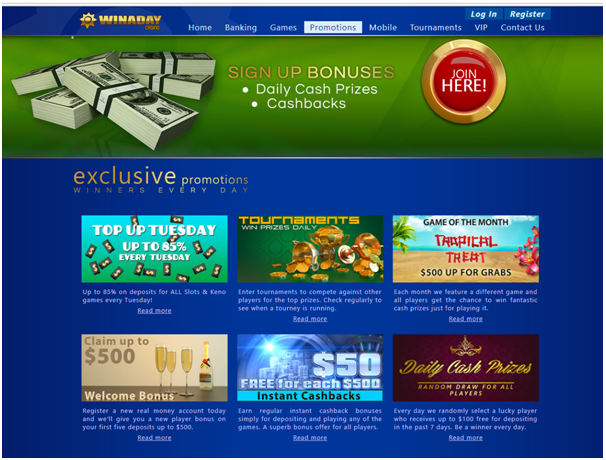 Cash back bonuses are also offered at winaday casino where you get $70 for each $500. $50 is earned every time your deposits at Win A Day exceed $500 and multiples thereof (i.e., $500, $1000, $1500, $2000, etc.). VIP bonus also gets a nice boost here on cashback. Bronze VIP get $55, Silver VIP get $60, Gold VIP get $65 and Platinum VIP get $70 just for making $500 in deposits! Also there are various tournament bonuses to grab. 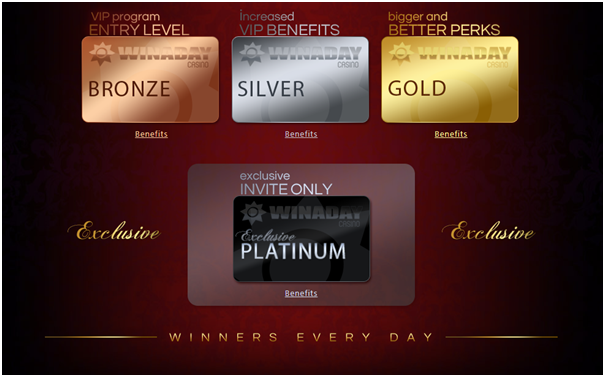 Like other online casinos Winaday casino also offers VIP loyalty program to is loyal and regular players. The VIP program is divided into 4 levels: Bronze, Silver, Gold and Platinum and as you work your way up the levels you will earn more great benefits! The awesome VIP benefits include free bonus offers when entering a VIP level, extra bonus percentages on regular promos and exclusive VIP offers. 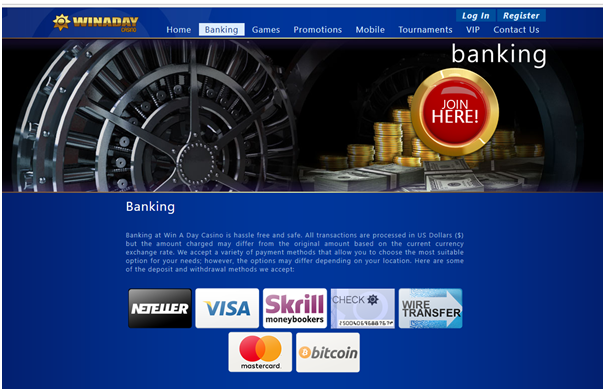 Winaday casino offers safe and secure online transactions. There are many banking methods available at the casino like Neteller, VISA, Skrill, Wire transfer, Mastercard, Bitcoin and more. Your details are fully encrypted to allow for 100% secure transacting and all payments (deposits and withdrawals) are processed free of charge. However, your bank or card issuer may charge international transaction and conversion fees of up to 10%. Withdrawal methods available at the casino are ACH, Bank Wire Transfer, Cheque, Neteller,instaDebit, Courier Check, Skrill. Withdrawal requests are paid out each Wednesday with speed and efficiency. The minimum amount you can withdraw depends on the selected payment method (from $25 up to $200). 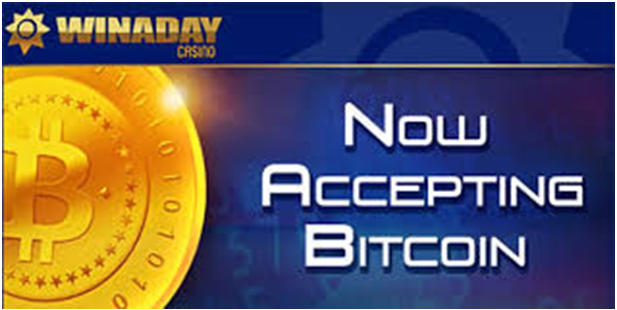 Withdrawals originating from bitcoin deposits and made as bitcoin withdrawals are processed the next business day. Note that the casino accepts only US dollars as mode of payment as well as Bictoins. To start using Bitcoins to play casino games at the casino you first need to set up a Bitcoin wallet. As you know Bitcoin wallet is where you first store your cryptocurrency. This only takes a few minutes, and as soon as you have a wallet you can start sending and receiving bitcoin payments. There are a few options of wallet to choose from: blockchain.info and Copay are simple and secure options, but you can also choose the one you like. Bitcoins can be bought from a local seller at localbitcoins. com. Online Bitcoin exchanges allow you to purchase bitcoins with major credit cards or bank transfers. The most popular exchange is Bitstamp, but you can also find other BTC exchanges and then send them straight to the e-wallet already set up. 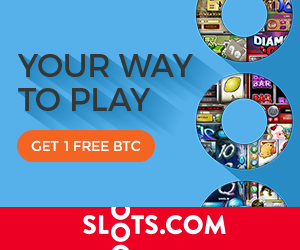 Now when you have got the Bitcoins in your wallet you need to make a deposit with bitcoins to fund your Winaday casino account to play games. If you have deposited using bitcoins, any resulting withdrawals will be processed for payment the next business day. 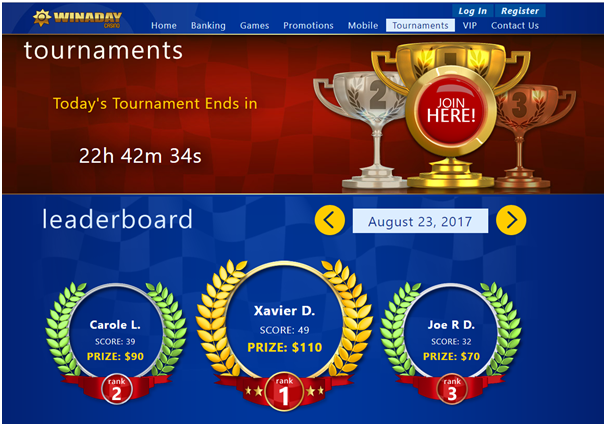 Win A Day Casino offers 24/7 help support and in case you need any assistance to play games, make deposits at the casino or having trouble in withdrawing your winnings you can contact the casino staff by email at support@winadaycasino.com for general queries, at billing@winadaycasino.com for online transactions. You can also have a live chat at the casino which is quite friendly and easy to do with instant help. There is an FAQ section which caters to all of your questions that you have in mind to clear your doubts.